Update: See this blog post for the latest. Also, our project was just featured on the UK Guardian Blog! A staggering amount of new satellite imagery is produced every day; millions of square kilometers’ worth according to one knowledgeable colleague. This is a big data problem that needs mass human intervention until the software can catch up. I recently spoke with Professor Ryan Engstrom, the Director of the Spatial Analysis Lab at George Washington University, and he confirmed that automated algorithms for satellite imagery analysis still have a long, long way to go. So the answer for now has to be human-driven analysis. But professional satellite imagery experts who have plenty of time to volunteer their skills are far and few between. The Satellite Sentinel Project (SSP), which I blogged about here, is composed of a very small team and a few interns. Their focus is limited to the Sudan and they are understandably very busy. My colleagues at AI-USA analyze satellite imagery for several conflicts, but this takes them far longer than they’d like and their small team is still constrained given the number of conflicts and vast amounts of imagery that could be analyzed. This explains why they’re interested in crowdsourcing. Indeed, crowdsourcing imagery analysis has proven to be a workable solution in several other projects & sectors. The “crowd” can indeed scan and tag vast volumes of satellite imagery data when that imagery is “sliced and diced” for micro-tasking. This is what we did for the Somalia pilot project thanks to the Tomnod platform and the imagery provided by Digital Globe. The yellow triangles below denote the “sliced images” that individual volunteers from the Standby Task Force (SBTF) analyzed and tagged one at a time. We plan do the same with high resolution satellite imagery of three key cities in Syria selected by the AI-USA team. The specific features we will look for and tag include: “Burnt and/or darkened building features,” “Roofs absent,” “Blocks on access roads,” “Military equipment in residential areas,” “Equipment/persons on top of buildings indicating potential sniper positions,” “Shelters composed of different materials than surrounding structures,” etc. SBTF volunteers will be provided with examples of what these features look like from a bird’s eye view and from ground level. Like the Somalia project, only when a feature—say a missing roof—is tagged identically by at least 3 volunteers will that location be sent to the AI-USA team for review. In addition, if volunteers are unsure about a particular feature they’re looking at, they’ll take a screenshot of said feature and share it on a dedicated Google Doc for the AI-USA team and other satellite imagery experts from the SBTF team to review. This feedback mechanism is key to ensure accurate tagging and inter-coder reliability. In addition, the screenshots shared will be used to build a larger library of features, i.e., what a missing roof looks like as well military equipment in residential areas, road blocks, etc. Volunteers will also be in touch with the AI-USA team via a dedicated Skype chat. There will no doubt be a learning curve, but the sooner we climb that learning curve the better. Democratizing satellite imagery analysis is no easy task and one or two individuals have opined that what we’re trying to do can’t be done. That may be, but we won’t know unless we try. This is how innovation happens. We can hypothesize and talk all we want, but concrete results are what ultimately matters. And results are what can help us climb that learning curve. 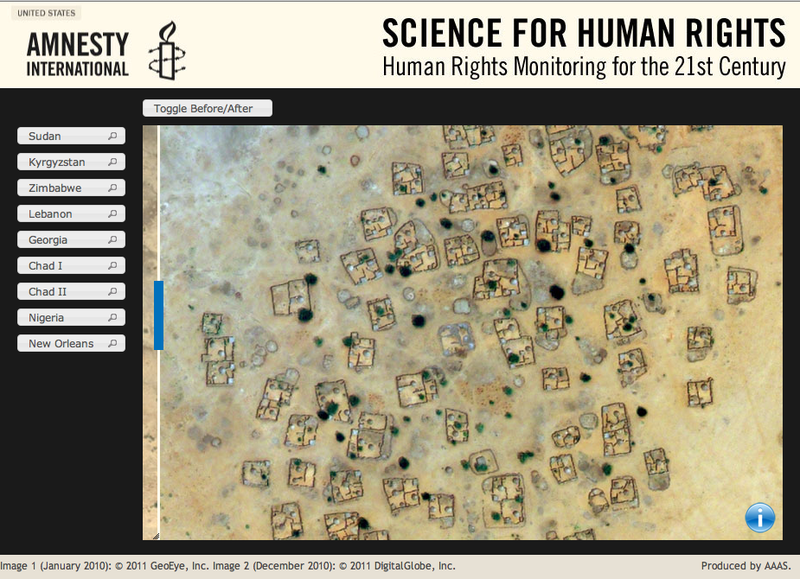 My hope, of course, is that democratizing satellite imagery analysis enables AI-USA to strengthen their advocacy campaigns and makes it harder for perpetrators to commit mass human rights violations. SBTF volunteers will be carrying out the pilot project this month in collaboration with AI-USA, Tomnod and Digital Globe. How and when the results are shared publicly will be up to the AI-USA team as this will depend on what exactly is found. In the meantime, a big thanks to Digital Globe, Tomnod and SBTF volunteers for supporting the AI-USA team on this initiative. • Will Using ‘Live’ Satellite Imagery to Prevent War in the Sudan Actually Work?